The interest will be lower with higher principal liquidity due to the financial asset coming down and the recovery on the annuity because of maturing of the projects. However,it will be made up as new annuity projects go live which they will add to the financial income. Certain entities which were earlier consolidated line by line like Jorbat-Shillong in Ind-AS are now not getting consolidated line by line as they are joint venture and are just getting added as a one-line adjustment in the profit and loss account. Depreciation is huge as projects which were partly commissioned during the year in FY2016 like Moradabad Bareilly and Pune Sholapur had seen a full commissioning and full year of depreciation this year. No decline in the construction income considering the order book in hand and also the future plans in terms of looking at very large value complex EPC projects. Preference share were issued at a premium of Rs.10/- therefore the coupon is actually 50%. 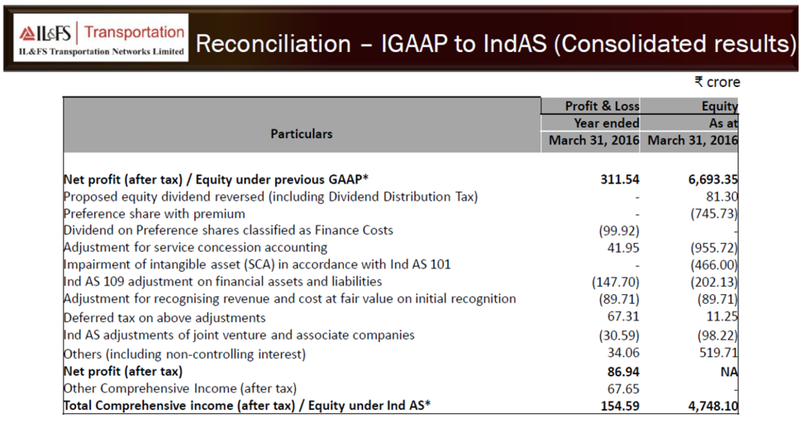 A portion of the preference shares is coming up for redemption this year, so they will be redeemed fully. New projects in BOT, EPC and international space like Laos and Dubai will drive the revenue and accordingly the EBITDA margin. The standalone debt has gone up by Rs.2000 Crores because of almost 50% classification of preference shares into borrowing, which were earlier a part of networth . Secondly, debt has gone up because infused of some debt from standalone balance sheet into into SPVs to pay high cost debt. Refinancing reduced the cost of borrowing by 200 to 250-basis points in interest cost of the SPV, elongated the maturity profile of the debt in line with the earning profile of the projects, which led to shorter period loans. Moreover, it helped to upstream the debt at the consolidated level. Put together on three projects, around Rs.350 Crores coming to ITNL from refinancing. Rs 9000 plus 750 Cr should be the debt for FY2016 and 11,670 Cr for FY2017. O&M income last year was Rs.1240 Crores, toll revenue was Rs.503 Crores, finance income, which is annuity income, was Rs.805 Crores, Construction income was Rs.5411 Crores, and supervision fee was Rs.77 Crores last year, this year is Rs.24 Crores. 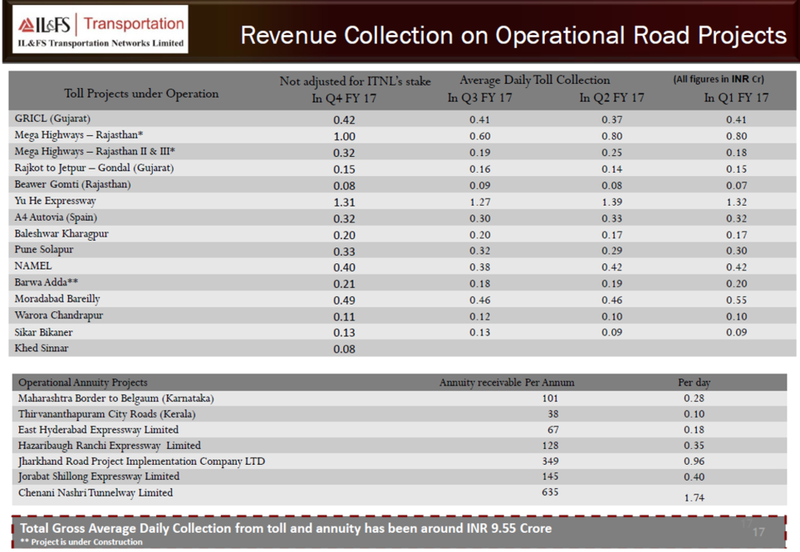 So total revenue from operations is Rs.7, 984 Crores versus Rs.8036 Crores last year. In addition to that there is other income which essentially is the interest income and dividend and sale of investments which is Rs.4917 Crores this year versus Rs.321 Crores last year. So this is a full breakup of Rs.8402 versus Rs.8356 Crores. The rest of the increase is coming because of the toll revenue increase and finance income increase and then there is an increase in the other income by around 30% this year. Operating expenses have gone down from Rs. 580 Crores to Rs. 556 Crores. EBITDA margin as percentage revenue for FY2017 at a consolidated basis is 43% as against 35% last year because of the higher construction margin, in projects in completion stage and due to increase in cost efficiencies as well as the de-escalation of collection of certain cost. Also, this year compared to last year there has been higher profit on sale of investment that has added to increase in the margin, also the dividend income from subsidiary has gone up this year compared to last year. 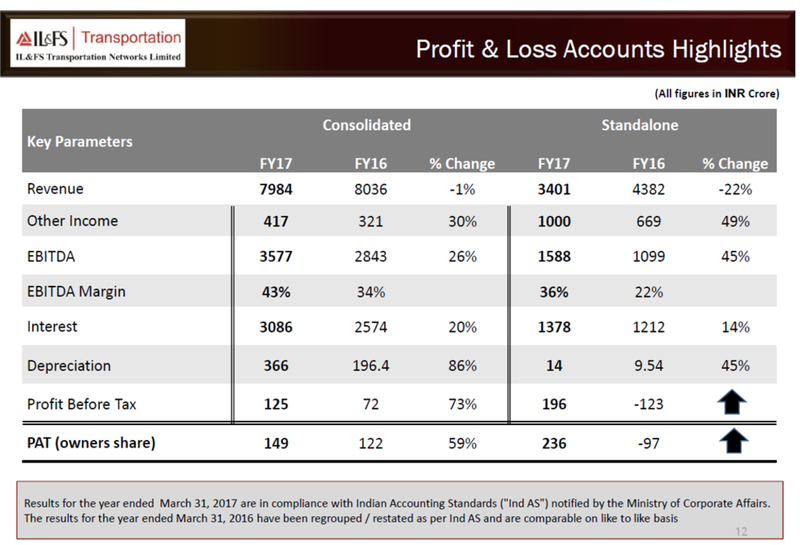 Toll income has gone up by 32% compared to last year, absolute terms Rs.160 Crores, which has also added to the increased margin in the overall basis. Rs.9.55 Crores per day with traffic growth increase in the range of 5% as compared to last year, but if you take the last quarter it has shown an 8% growth. 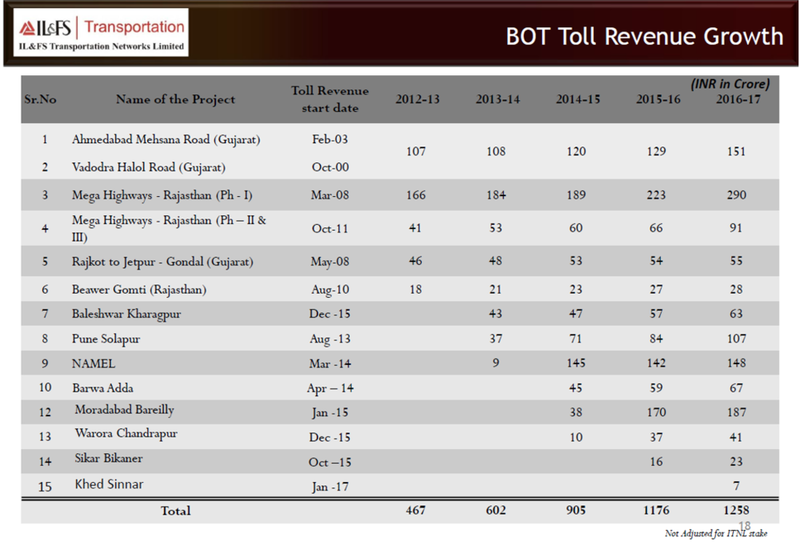 The toll went up by 32% on a rupee basis but on traffic basis last quarter grew by 8% in the PCUs and for the whole year 5%. Rs. 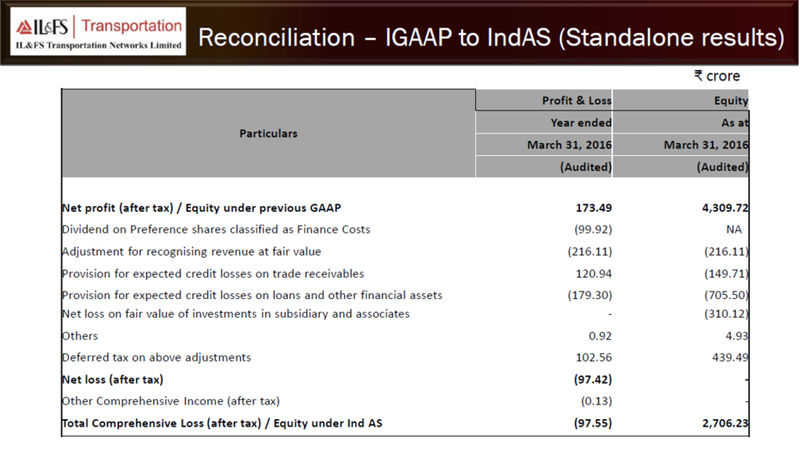 9.5 Crore is not stake adjusted. Will increase to around Rs.11.9 Crore next year and Rs. 14 Crore next to next year, after considering the 5- 7 projects on ground, which are going to get completed. 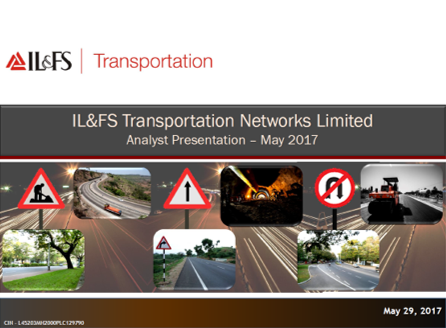 Traffic grew by 8% last quarter as compared to the previous quarter, an average of all assets, CAGR of 8% or 8.5%. Collecting around Rs.24 – 25 lakhs per day from Barwa-Adda, however it will increase to Rs.46 to 47 lakhs per day after setting up of second toll plaza. Raised Rs.750 Crore from NCDs issuance in ITNL on March 31 at a very competitive market rate of around 9.5% which has been used to retire some of the costly debts in SPVs and infused that debt in SPV which has led to a reduction in the cost of borrowing at the group level significantly.Received all the necessary approvals and are hoping to complete the entire InVIT transaction in the quarter one of this year. Raised Rs. 750 crores by NCDs. Completed refinancing in three of our projects. Out of total 35 projects, 30 road projects and 5 Non-road projects. Of the 30 road projects, 23 road projects are operational. The Total length of all the road projects stands at around 14,016 lane kilometres. Commissioned three projects during the quarter, Chenani Nashri Tunnel (CNTL) achieved Commercial Operations on March 8, 2017, Khed Sinnar on January 31, 2017 and Rail Project, Rapid Metro South Extension on March 31, 2017. Seven projects under construction: ROB project in Gujarat and outer ring road stretch in Jharkhand both of these are annuity projects, Amaravati-Chikhli and Fagne-Songadh both in Maharashtra awarded by NHAI are BOT (Toll) projects. Will receive Rs.1200 Crores from Barwa-Adda and Khed-Sinnar project. Down selling in both Barwa-Adda and Khed-Sinnar have drawn down significant debt portion which led to unwinding some of the receivables locked up in these SPVs. Once the GST is rolled out, there wil be a fair amount of negotiations s there may be some corrective measures definitely on ground by July when GST rolls out, because this sort of integrated collections will need a redefinition and rescoping.